There they are, coming at you, Christmas decorations! And to think it’s not even Halloween. I’m in London, staying at an apartment near Covent Garden, where this photo was taken. 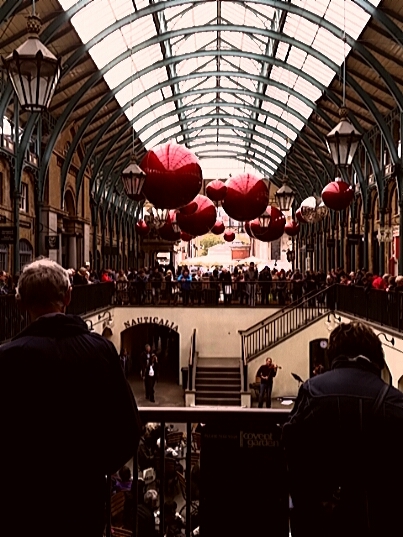 Covent Garden was a bit of a pit for a while, just the lowest form of tourist tat. Half of it, the half you see here, still is. However the other half is positioned opposite a huge Apple store. The managers must have used that to upgrade the tenant base. We don’t need another Dior outlet — we don’t! Stop whining! — but it is nice to see a cafe run by Jamie Oliver and other upscale local purveyors of whatever. I might head back there for lunch tomorrow. I stopped in here today on my way to Neal’s Yard for some bread and cheese. Yesterday I had the great good fortune to join friends for dinner at Frenchie, possibly the hippest restaurant in Paris. Today I started to wonder whether I could define what distinguishes terrific French food from terrific English food. It was Frenchie and Grand Vefour vs. Neal’s Yard and Rules, I guess. So far I am testing the hypothesis that French food is more about subtlety, transformation and balance. English food is more about a more assertive use of a principal ingredient, building a dish around it and enhancing it. Further exploration will be necessary. Fellow explorers welcome.